Although the Amazon Kindle (2014) is not the most premium of Amazon’s e-readers, it is still built with high quality parts and has all the functions you want out of a basic e-reader. Its design is fairly plain and not as stylish as its cousins, the Paperwhite or the Voyage. The entire device has a plastic finish with a solid black color. The back is slightly curved allowing it to sit comfortable in your hand. Despite the lack of style, the Kindle is surprisingly well-built with all the functionalities of a great e-reader. The only button is the power button located on the bottom edge of the Kindle. The keyboard and page-turning buttons have disappeared. Amazon has since removed them in favor of a touchscreen interface. If you must have page-turning buttons, then unfortunately you have to find an older Kindle model as all the newer models do not offer it. Similarly, the MicroUSB port, used to charge the device, is the only port. The headphone jack, previously located near the power button, is now gone. 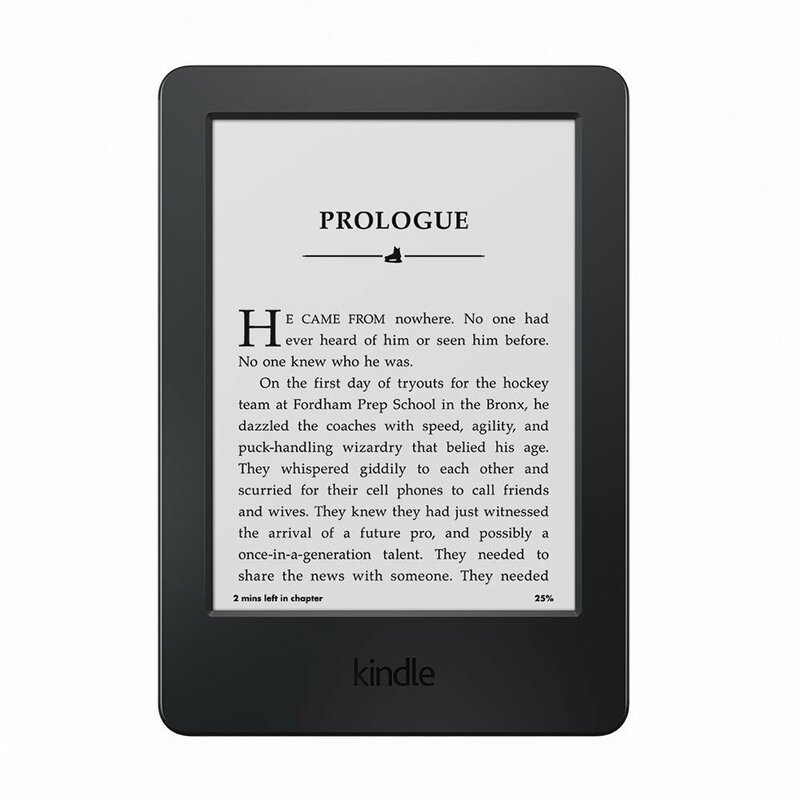 With the exception of the bottom, the edges on all sides of the Kindle are featureless and all controls are handled within the screen. The dimensions are 6.7″ x 4.7″ x 0.40″ and weigh just 6.7 ounces. It is thicker than the Paperwhite and significantly thicker than the Voyage. However, it weighs slightly less than the 7.2 ounce Paperwhite and slightly more than the 6.3 ounce Voyage. Relative to the Paperwhite and Voyage, the Kindle is much thicker but not enough to make a significant difference. In fact, if you are an owner of previous generations of Kindle, then this model is approximately the same in thickness. However, if you care about the thickness or size factor then the Paperwhite and Voyage might be for you. The new Kindle is touchscreen and any interaction, excluding power on/off, will be done using the display. The touchscreen has a matte finish with a slightly gray/white background resembling paperback books. It is important to note that the Kindle is not back-lit, like the Paperwhite or Voyage. Because of this, you need light in order to read, similar to reading books in dark environments. The new display is made using a new “Carta” display instead of the old “Pearl” display. The text is noticeably sharper and bolder than the previous display. Although that can be due to Kindle’s new screen resolution, which is 167 pixel per inch. Even though it is a dramatic improvement over previous generations, it still does not up to par with the Paperwhite and Voyage, which have an amazing 300 pixel per inch display. The touchscreen is responsive and accurate. I had no problems using the on-screen keyboard as the screen seemed sensitive enough to respond to every soft touch. I didn’t have any issues flipping through pages because the Kindle was a perfect size. Page flipping didn’t require me to change my reading position, all I had to do was move my thumb to the edges of the screen. It seems Amazon has tried very hard to make the Kindle resemble a traditional book. Family sharing is a feature that allows you to share books with your family free of charge. You can also share books with your spouse or partner with your linked Amazon account. The dictionary feature is what separates a Kindle from traditional books. If you ever find unfamiliar words while reading, you can look up definitions with Kindle’s built-in dictionary. Kindle’s built-in dictionary is integrated with the New Oxford American dictionary, making it easier to access definitions straight from your Kindle. To lookup definitions on Kindle, simply highlight each word and the definition entries will popup. Similar to the dictionary feature, Kindle has the ability to translate words instantly by tapping any word or highlighting an entire passages. The built-in translator is powered by Bing Translator. Kindle only comes with a Wi-Fi model, it does not have a 3G option. The more premium Paperwhite and Voyage comes with both Wi-Fi and 3G models. This may cause minor inconviences when you are in areas without Wi-Fi hotspots available. If you want internet wherever you go, then consider getting the Paperwhite or Voyage. Just like all Kindles, this e-reader has a long lasting battery life. The battery can last four to six weeks before needing to recharge. That is of course with the Wi-Fi turned off and casual reading. If you plan on reading daily and with Wi-Fi left on, then the battery will last just under a week. When compared to a tablet or smartphone, the reading experience on a Kindle is by far superb. But if you were to compare the Kindle with its more expensive cousins, the Paperwhite and Voyage, then it’s no question the Kindle is inferior. Let me explain. The Kindle is lightweight and comfortable to hold. It has the same e-ink technology as many popular e-readers. The difference comes from the quality of the display. Both the Paperwhite and Voyage come with a high resolution display at 300 pixels per inch, while the Kindle has a 167 ppi display. The text on the more expensive Kindles are higher quality, sharper, and finer in detail. Another drawback the Kindle has is its inability to read in the dark because it does not have a built-in backlight. In order to do reading during the night or in dark environments you need to have a light source. Amazon Kindle remains year after year the best e-readers ever. Although the Kindle lacks key functionality of a high-end e-reader, it has all the essential components of a great e-reader. If you have a tight budget and are looking for your first e-reader experience, then the Kindle is perfect for you. 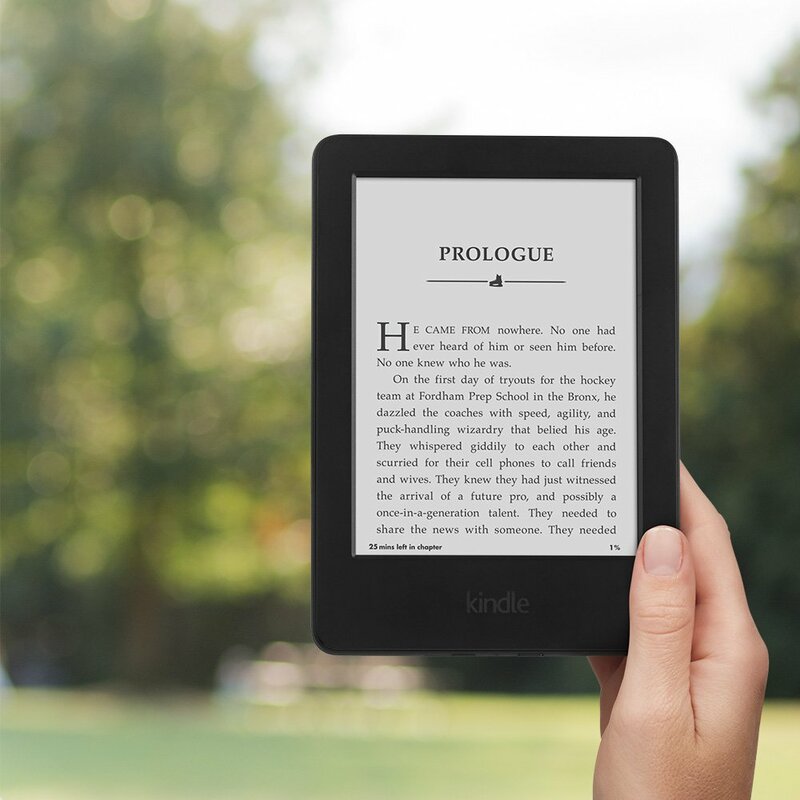 People who have previously owned Kindle may consider a more high-end e-reader such as the Paperwhite or Voyage, which presents a significant upgrade in hardware and functionality. The most affordable Kindle in a line of premium high quality e-Readers. It has a long lasting battery that gives you ease of mind. Kindle has everything you need to get started on a basic e-Reader.